With the unscrupulous Alan Greenspan willing to sound a death knell for capitalism and many political sheep willing to nod their empty heads in agreement it is time to give capitalism its due and debunk this attack on free enterprise. Capitalism has never fully existed because there have always been politicians who found ways to pass laws that would gum up some portion of the economy. There were the corrupt politicians who passed the Sherman Antitrust Act to prevent or punish monopolies while ignoring the fact that free enterprise allows competition and therefore prevents monopolies. Meanwhile the government monopolized the first class mail delivery and ignored the Post Office was a monopoly. Seems they also overlooked the government’s role of legally forbidding competitors with the Post Office for first class delivery. The ignored the fact that only government can create and sustain a monopoly since they permit no competition. Meanwhile the politicians continued exercising their ability to ignore the obvious even to this day. What would have been so bad about some competition in the first class mail service business? The parcel business has worked well with competition and without outlandish stamp increases on all too frequent intervals. In true government thinking the option is not considered or even mentioned. This should indicate there is something going on in the politician’s head that evades progress. Politicians are good at promising what they discover is popular no matter how outrageous ( like Global Climate change “concerns”), They go blank when anything smacks of less government. Reform to them means only more of the same disguised by different agency names and different bureaucrats. Under capitalism these politicians would be restricted from muddling in the world of commerce. They would not be able to distort the mortgage market because they erroneously believed giving even the poor loan risks a chance at home ownership could be enforced by law. They would not be able to pass laws that took taxpayer money and dumped it in the laps of businesses that had not met market conditions. Under capitalism there would be no bailouts. For all his mumbling in front of Congress Alan Greenspan knows this. If there are no bailouts there is no such thing as too big to fail. Risk is recognized as a very real consequence of poor management. This is a major virtue of capitalism and it leads us to the reason it is a far more moral and practical system than any hodge podge mixture of government with the economy. For risk management requires calculation and courage. One cannot look to “safety nets” or “lenders of last resort” after ignoring sound lending principles, character judgements and adequate reserves. These are foreign ideas to politicians and explains why they thrive (temporarily) on deficit spending. In the long run they bankrupt whatever they are “governing. People who follow the politician’s lead end up with the kind of dependence that weakens their judgement and leaves them begging for bailouts. Mixing government with economics makes parasites of men. Capitalism requires they stand on their own and take responsibility for they know there are no safety nets nor should there be. A trapeze artist with a net is an acrobat. A trapeze artist performing without a net is a courageous artisan relying only on his ability. This is the kind of people who emerge in a capitalist society. Knowing there is no net to fall into they hone their skills and adhere to the principles that will minimize their danger. Donald Trump in his book “The Art of the Deal’ articulates this principle by stating how important it is to him to avoid major losses. This is a far different approach to business than a car manufacturer who lets unions price him out of the market and hopes the government will cover his losses. Which man has the capitalist viewpoint and who is willing to get along with whatever politicians are throwing at him? Which is the man of moral stature and who is the man of cowardice? Capitalism requires courage to take risks. Capitalism requires independence and honesty. No one rises in the world of business by being a crook, a liar or a toad. There are those that do arrive in a position that they cannot handle. As the business fails they look for bailouts and cronies that will pacify their inadequacies. They find them in Washington. The trend of the United States away from independence by the individual and towards a “safety net” that bails out the poor managers is a trend that can only lead to the kind of crises we are seeing today. It was not capitalism that failed. Look at the number of regulations and the number of regulators if you think American was operating under even a semi free market. The politicians saw the finger starting to point at them and raised the issue of the failure of the free market. The S.E.C. would have a hard time explaining why freedom was rampant with the number of regulations they are charged with. Another virtue of the capitalist is the one that makes him able to succeed. That is the virtue of selfishness. It is the ability to recognize and act upon that which will make a profit. No non profiteer or politician sees the virtue of making a profit from offering a good or service by trade. A business that doesn’t operate on a profit motive has to necessarily operate without a bottom line. This means in the case of non-profits that you operate on whatever revenues you acquire and wealth accumulation is only a sideline. Production and profit are not tied together as they are in the world of profit making. 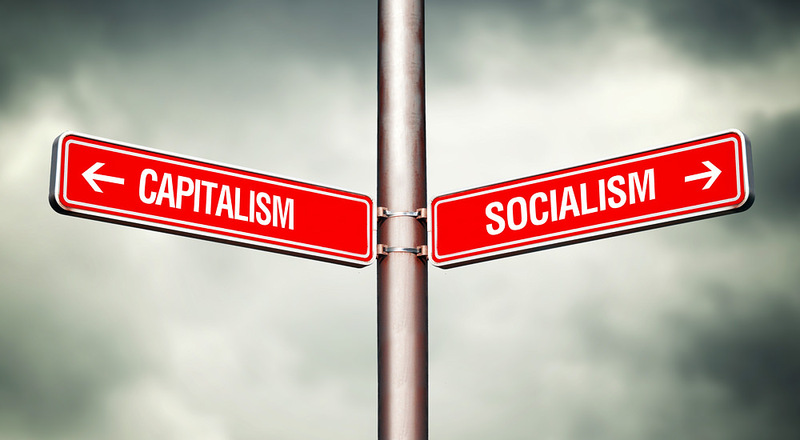 If the United States decides to take the road to Socialism ,as it currently is doing, the capitalists will perish and in their stead will arise the dependent, parasitical, corrupt. Bribes and favoritism are components of socialism that cannot be avoided. The begging for public money will explode ( as is happening) and the politicians will respond with outpourings of funds backed by nothing but the empty promises they have always relied upon. Ask yourself what is the moral system: a system where people act in their own interest and take responsibility for their actions and welfare which capitalism represents or a system where begging and redistribution coupled with eventual bankruptcy such as socialism? The mistaken notion that morality must focus on others has been the ugly distortion that has given us a war that has our soldiers fighting for the ability of Iraqis to dip their fingers in an ink well, pork barrel earmarks that are unaffordable, distortion of the mortgage market that left a pile of unrecoverable debt and the looming wrath of inflation staring us in the face. It was not any master plan that corrupted America or any given politician or any greedy businessman. It was the set of ideas that made capitalism look like some sort of necessary evil that would eventually be the instrument of destruction. This distortion of capitalism led to the accusation it was at fault for our economic ills while it was completely innocent and never in existence. This is what a distorted morality will do. It blames the good for the evils of the code it cannot bear to question. This is how pervasive altruism has become. Based on a cry for faith ( unquestioning belief), it has produced a stranglehold on the minds of those who have attached virtue to the laziness of unquestioning and not challenging commonly accepted dogma. Capitalism will not stand under such rationalizations that are necessary for distortion and evil. Just as you cannot bailout businesses with empty pocketbooks so you cannot bailout a moral system with unjustified accusations. Just as the Middle East will never achieve peace under the banner of religious dogma neither will capitalism triumph with the specter of altruism denouncing its goodness. Sometime, just as there was a period of enlightenment, there needs to be a period of reawakening of the virtue of critical inquiry that seeks genuine fundamental solutions to obvious impending problems. That period will require more than simplistic superficial chanting of sound bites and include a chain of reasoning that excludes logical fallacies dismissed for centuries. Peace cannot emerge from dogma nor can economic stability and prosperity. If the base of a set of ideas will not be questioned ,the consequences of those implemented ideas will be destined to the results of their mistaken premises. No amount of bailout will correct such oversight. No amount of popularity will overcome errors in thinking. No amount of pleading and begging will produce the kind of independent thought that capitalism is based on and relies upon. If American wants freedom and capitalism then she must wake up from the long slumber of dogma she has relied upon and stand independently for what capitalism demands. Capitalism deserves and requires respect.